7-Eleven's Chips Ahoy Hot Cocoa features the taste of Chips Ahoy chocolate chip cookies in a cup of hot cocoa. A small cup cost me $1. There's a pretty powerful milk chocolate flavor to the drink that's meant to stand in for the chocolate chip, it's slightly creamier and richer than the run-of-the-mill instant hot cocoa. To complete the chocolate chip cookie flavor, there's a note of brown sugar to round it out. The overall effect makes for a very enjoyable cup of hot cocoa. 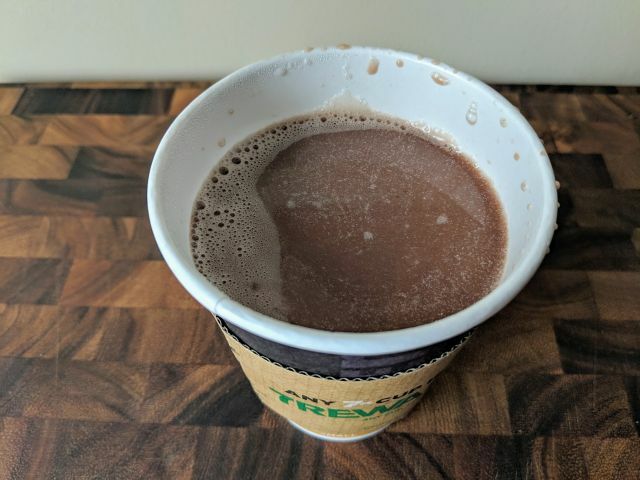 Unlike the Oreo Hot Chocolate, there does not appear to be actual cookie ground into the drink, which makes for a smoother if less novel drink.